“Thank you, your Eminence, you’ve taught me so much about religion,” sneers Orlando Bloom in Ridley Scott’s Crusader-era epic Kingdom of Heaven (2005), now celebrating its 10th anniversary a bit early with a new Blu-ray edition. “Your Eminence” is the Patriarch of Jerusalem, who has suggested either abandoning the Christian populace of Jerusalem to be slaughtered by Muslim besiegers or converting to Islam to avoid martyrdom and repenting later. 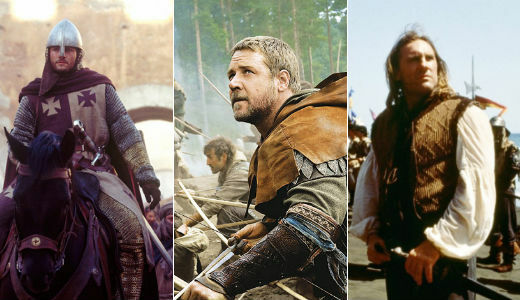 A self-described atheist, Sir Ridley Scott has developed a generally bleak vision of religion, particularly the Judeo-Christian tradition, throughout his work, above all in historical sagas like Robin Hood (2010), starring Russell Crowe and Cate Blanchett, and 1492: Conquest of Paradise (1992), starring Gérard Depardieu. Notably, atheist and agnostic filmmakers have produced some of the most persuasive and evocative depictions of faith and religion. Notable examples include Xavier Beauvois’ Of Gods and Men (2010), Roland Joffé’s The Mission (1986) and Pasolini’s The Gospel According to St. Matthew (1964). While the view of religion in Scott’s work is consistently dim, it isn’t wholly negative, and Kingdom of Heaven offers his most concerted effort at fairness. The film romanticizes the 12th-century Crusader Kingdom of Jerusalem as “a kingdom of conscience, peace instead of war, love instead of hate,” in which Christians, Muslims and Jews enjoyed a tenuous but peaceful coexistence. This peace is threatened, we’re told, by “fanatics on every side,” though in practice we’re never shown Muslim fanatics, only Christians. (The Knights Templars are the main villains.) There are also good Christians, notably a priest of the order of Hospitalers, though he’s really a spokesman more of conscience than doctrinal faith. Kingdom of Heaven ultimately suggests that, while individual believers may be men of character, the world might be better off without religion, and in particular without holy sites, which become bones of contention between competing groups. Sadly, the legacy of religious violence in the Holy Land makes this point of view at least understandable. Robin Hood offers a darker view of Catholicism generally and the Crusades in particular, emphasizing Christian atrocities against fellow Christians as well as innocent Muslims and the hypocrisy and corruption of bishops and even popes. Neither Kingdom of Heaven nor Robin Hood acknowledges the earlier Muslim conquests that provided the initial impetus for the Crusades. Among the many faults of 1492: Conquest of Paradise, a film well deserving its lack of love from critics and audiences, is a risible reinterpretation of Christopher Columbus as a heretic freethinker heroically challenging the institutionalized superstition and fear of 15th-century Catholic Spain. A scene offering what would have been perhaps Scott’s most sympathetic depiction of Christians was unfortunately cut from Gladiator (2000), also starring Crowe: namely, a portrait of Christian martyrs devoured by lions in the Coliseum. Gladiator does treat pagan piety sympathetically, notably in symbolic sequences imagining the hero’s reunion with his murdered family in the afterlife. Scott’s latest project, due in December, is Exodus: Gods and Kings the first major Hollywood adaptation of the Moses story since The Ten Commandments (1956). Could engaging a biblical story revered by all Abrahamic faiths elicit Scott’s fairest treatment of religious themes to date? Or, perhaps, the clearest statement of his antipathy toward religion?